I've owned BPT shares for a while now. With the plunge in oil prices the performance of BPT hasn't been pretty lately. If I were to try to time the oil market (which I am not recommending), then I think that buying some BPT right now might be a good idea. The shares are trading just under $29 as I write this. If oil recovers, as its likely to eventually do, then BPT will go up. BPT doesn't track oil exactly but its very close and the price goes up and down with oil. 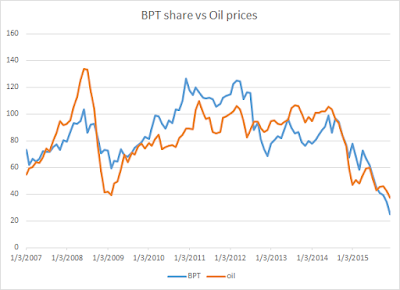 To see how well BPT tracks oil I got the last 10 years worth of monthly prices and charted them together. I used the monthly closing prices of BPT off Yahoo finance. Note thats just the share price and does not account for dividends paid. Crude oil prices are from the EIA and are the WTI Cushing, OK price. I'm actually not thinking of doubling down on BPT right now and in fact I'm considering closing out my Roth IRA with Scottrade and transferring to Fidelity.